By creating a critical mass for public infrastructure the mid-rise model is the key puzzle peace of a vibrant and sustainable city. Therefore we accept the challenge to make it the most wanted in the market. Within the quarter we create uncompromised green part and two compact built blocks with highly personalized streets around. Basic block is made of compact BUILT and exposed GREEN parts. The width of the block is defined by perimetric building zone and rationally planned parking zone inside the block. The minimal Block width is made to create maximal density on one side to free up the rest one. This type of asymmetrical block enables to form endless variety of city patterns, by simply rotating and copying standard blocks. To get the best of both we diversify building types in height. This way 12 storey apartment towers gets plenty of air around while the majority is enabled to enjoy living close to the ground. Gradual range of typologies is proposed - LOW RISE (section with central access), MID RISE (gallery) and HIGH RISE (urban villa/tower). Each type is capable to fit the given range of apartments and at the same time it is flexible to change if needed. All types have common basic parcels defined by the width of living room (4m) and bed (3,5m) room. Though types differ in shape, only few typical elements are used to construct them. By mixing building types in different proportion variable land use ratio can be achieved, therefore the same standard housing system could be used for lower and higher model options. It is another great tool to make unique neighborhoods while using the same tool box. Ground floor apartments with direct accesses are the key elements to make local streets safe and cozy. Private terraces spaces are adjacent to the ground apartments. Living rooms are facing the street while bedrooms located on the inner court side. Like the whole concept the green court is rather seen as field of possibilities than finished design. It is made big enough to accommodate all necessary residential facilities (playgrounds, garbage containers, kindergarten, dog walking fields, sports grounds…) as well as any initiatives by local residents. 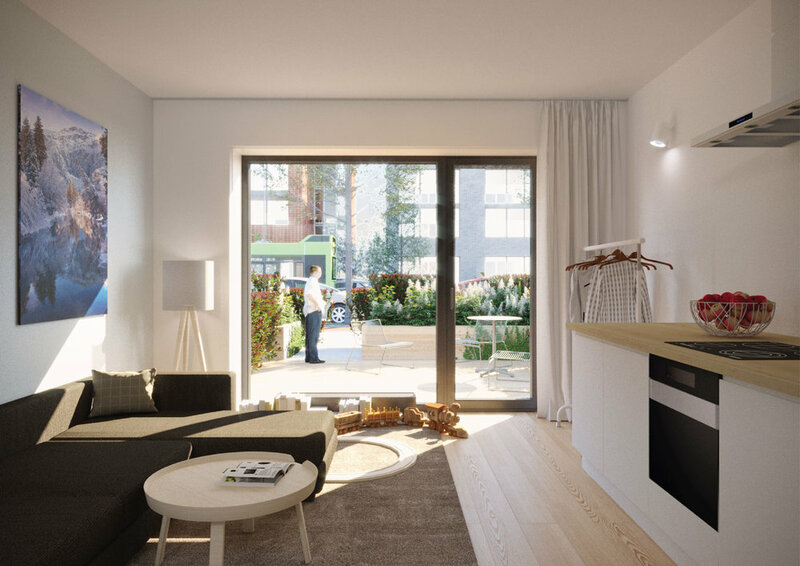 Dedicated space for collective initiatives is meant as the powerful tool encouraging residents to take active care of their own living environment. Common necessary elements are designed as standard elements and meant to be built at the initial phase of development. While today streets are rather engineering corridors, we propose to shape it as grate public spaces with perfect balance of public and private. Therefore we program maximum entrances from the ground floor and provide ground floor apartments with private terraces in front. In the local street section private terraces are slightly lifted to provide extra privacy. Residential streets with double parallel parking meant for a low speed local traffic with extra capacity of parking places next to doors. Residential street with limited car access is the core of the block where private and collective space is dominant. Therefore any passenger would feel as a guest there. This street is the flagman of perfect quality of living on the ground floor. It must be widely used on the central areas close to the public transport knots where car parking norms could be reduced. Inner court yards dedicated for parking, here rational on ground parking is designed. Cars along private yards are covered with the shed, enclosing the parking from the terraces and creating extra distance from windows. The whole parking is covered with trees, this way hiding cars and bringing a lot of greenery in to the yard. The rest of parking places are located in the streets. If needed car free streets can be planned by building a multi storey parking in the yard. Each ground floor apartment can be turned in to small services space, therefore ground floors are planned with extra height. Medium commercial units can be planned in T1 and T3 typologies. Even bigger ones can be planned in the inner court.